On a warm summer Friday, the line at the Magnum ice cream shop in New York City's SoHo neighborhood nearly spilled out the door. By mid-afternoon, a sign went up to say the shop was out of chocolate ice cream but still had "plenty of our delicious vanilla bars" for customers to dip in chocolate and various coverings not available in Unilever's supermarket offerings. On the next corner, at the Chobani Café, all tables and counter spaces were taken by patrons tasting dishes way beyond fro-yo, such as sandwiches made with simit, a bagel-like Turkish bread. Also on the menu, along with sweet and savory Greek yogurt dishes: "Hamdi's rice pudding," a nod to the company's Turkish founder, Hamdi Ulukaya. Magnum and Chobani are part of a growing group of packaged-goods companies that have ventured into the hospitality business as a marketing strategy, opening both pop-up and permanent eateries that are both a showcase and a laboratory for their brands. The opening of Magnum's pop-up in SoHo this past spring (closing at the end of this month) was followed weeks soon after by the opening of Kellogg's NYC, a cafe with a menu built around breakfast cereals. And there is more to come: This month, PepsiCo plans to open Kola House, a bar and event space in New York City's hip Meatpacking District. Meanwhile, Chobani is doubling down on its café strategy - which also included a pop-up café during the Sundance film festival - with plans to open its first in-store cafe next month inside the Target store coming to New York City's Tribeca neighborhood. "I think we're only scratching the surface with this idea," said Peter McGuinness, Chobani's chief marketing, and brand officer, in an interview with CMO.com. Just as online retailers have discovered the need to expand into the real world - with everyone from Warby Parker to Amazon looking at storefront space to augment their e-commerce experiences - packaged goods brands are following. "This whole experiential thing is a way to bring the brand to life, and consumers expect that of us. But it is also a way, given mobile and digital technology, to scale something that is an experience and have a much larger impact on consumers," said Seth Kaufman, Pepsi North America CMO. A number of factors have combined to make these locations a viable strategy, including changes in retail, demographics, and media. Shifts in the retail model have reduced the impact of traditional packaged-goods retailers, such as grocers, in building brands and sales, leading CPG marketers to seek out new channels. It's more difficult to do traditional shopper marketing, such as sampling and in-store promotions, when dealing with online retailers, such as Peapod or Instacart. "We use the experience at the cafe to engage with our fans and give them a firsthand look into our brand," McGuinness said. 'We think this idea has a lot of potential, both as a marketing vehicle but also as a business." CPG marketers have realized that tasting food outside of a shopping mindset is more memorable and adds more value to the brand, said Marcia Lorente, head of strategic planning at Campbell Ewald. The agency launched a pop-up coffee bar in SoHo last year to promote the DeLonghi coffee maker brand. These new cafes are both a marketing beachhead and a lab to engineer new products and new strategies. "They just basically opened the doors to the lab," said Charlie Hopper, principal/writer of ad agency Young & Laramore, in an interview with CMO.com. Chobani, for example, incubated its new strategy to expand the brand through savory dishes and snacks in the Chobani Café. "It's a really cool way to get a sense of where we're headed and to get feedback from our fans," McGuinness said. The experience of sampling products in an upscale cafe is not quite the same as picking it off the shelf at a supermarket, but marketers noted the test and learning at cafés still yields valid insights, sometimes better than those from focus groups. "When done well, they should epitomize the ideal consumption moment in a consumer journey," Lorente said. Tasting and testing also suits the rise of the Millennial consumer, who has a different way of relating to brands and values experiences. "They are the first generation to not distinguish online and offline experiences. They see a singular reality and brand narrative," Lorente said. But Millennials also crave sensory experiences, which is why cafes are enjoying such a revival, she added. Millennials are also driving another trend helping the new cafe society: the decline of traditional media as a channel to build mass brands and its replacement by social media. 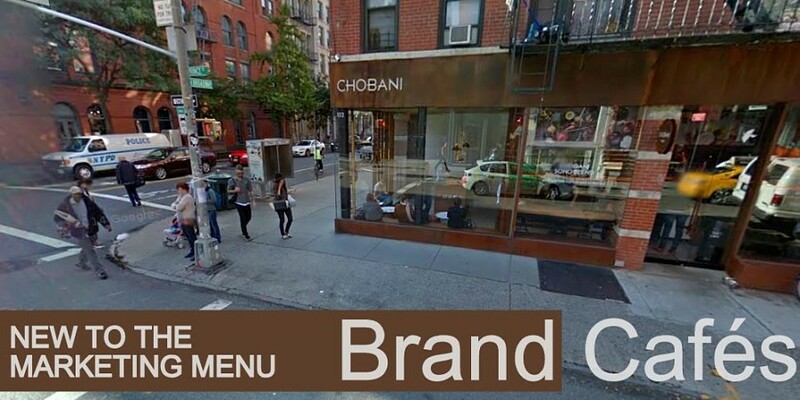 Chobani said that its SoHo cafe is one of the most Instagrammed restaurants in New York; Pepsi expects Kola House to augment its social media and its pull with influencers, with plans to offer music events in partnership with Live Nation as a social draw. But running a restaurant is different than selling packaged goods. It has its own barriers to entry and operational difficulties, such as health-code regulations and tight operating margins common in the restaurant business. Facing the operational issues of running an eatery also involves a change in mindset and tactics for CPG marketers. Marking the cafes as a marketing expense and running them at a loss is not an option, experts said. McGuinness noted the Chobani Café has had double-digit sales growth each year since opening in 2012. Losses can affect functions that are depending on cash flow; service and quality can suffer eventually, Hopper said. "Operating at a loss as a marketing stunt can work for a while," he said, "but not for the long run." And in the long run, a poor experience will damage the brand, which is another risk, experts said. "They seem like pretty valid experiments but dangerous ones. God forbid someone to get E. coli," Hopper said. Food poisoning aside, the risk is why most CPG companies partner with experienced restaurateurs. To open Kellogg's NYC, Kellogg Co. partnered with Christina Tosi (better known for the New York restaurant chainlet Momofuku Milk Bar) and restaurant consultant Antony Rudolf (formerly associated with Per Se chef Thomas Keller). Pepsi has partnered with hospitality group The Metric to open Kola House. "Every day they open the door, there is a risk something could go wrong and damage the brand," Hopper said. But, he added: "There's always the excitement of adding to the brand." Content provided by CMO.com by Adobe via Thomson Reuters. All Rights Reserved by the Content Provider.